The aging process brings with it a number of changes in our skin. Some of these changes include fine lines, wrinkles, crow’s feet and even blemishes. Frown lines are lines that appear in between the eyebrows and are clearly visible as deep furrows. These days, a lot of attention is being paid in the cosmetic world at treating these frown lines. Botox® injections are a simple solution to removing frown lines and in this article we should take a brief look at this. Botox® injections are a popular treatment modality for treating a variety of different skin defects. It uses not only range from treating and managing fine lines and wrinkles, but also includes complex medical procedures such as managing muscle spasticity in cerebral palsy. However, in the cosmetic world, Botox® injections have become extremely popular in managing frown lines as treatments are simple, painless and relatively quick. Furthermore, the results that are obtained are excellent and patient satisfaction rates are extremely high. Affordability means that more and more individuals are now seeking this treatment. But how exactly does Botox® remove frown lines? Well, frown lines are often due to alterations in the muscle tone of the muscles that underlie the skin. When Botox® is injected into these muscles, the tone is reduced and the muscle is paralyzed. This paralysis causes smoothening out of the frown lines, causing them to literally disappear. The main benefits of using Botox® injections are that the effects are almost immediate and the procedure is so simple. It literally takes a few minutes to perform this procedure and can be even done during a lunch break. Once the patient arrives at the cosmetic practice, the area where the injections are due to be administered will be cleaned with antiseptic solution and injections will be quickly administered using a fine needle. The patient only feels a small amount of pain due to the needle and once the procedure is complete will see changes straight away. Discomfort is minimal and side-effects are few. These days, Botox® injections to remove frown lines are not only sought after by women but also by men as well. 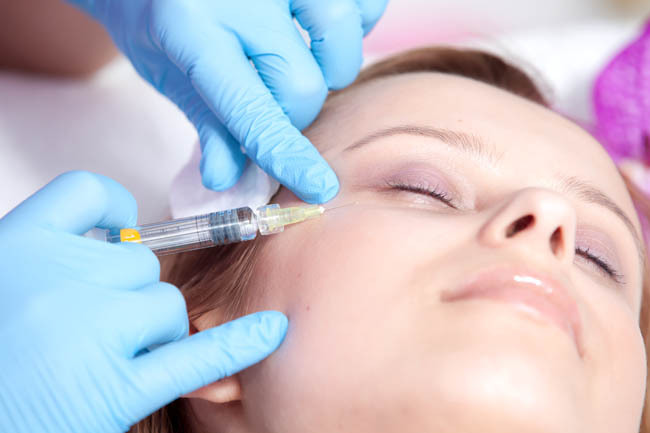 Compared to other plastic surgery options, Botox injections are relatively cheap and can achieve the required result without the risks of anesthesia. By removing frown lines, the face appears a lot brighter, skin appears a lot smoother and the individual appears a lot younger. Botox® injections have become extremely popular these days, and more and more people are seeking this form of treatment to manage frown lines. Treatments only take a few minutes and have excellent results. The procedure is simple and easy and it is therefore comes as no surprise that patients keep coming back for more in due course. It’s important that whoever offers Botox® treatments, whether it be a physician, nurse, dentist or nurse practitioner, they are properly trained.